FILE - Ernesto Montenegro, director of the Colombian Institute of Anthropology and History of Colombia, talks to reporters while he shows a picture of remains of the galleon San Jose in Cartagena, Colombia, Dec. 5, 2015. Colombia is making progress toward salvaging a Spanish galleon carrying jewels and coins that sank more than 300 years ago, President Juan Manuel Santos said Wednesday after receiving a proposal from an investor to bring it to the surface. The San Jose, thought by historians to be carrying one of the largest unsalvaged maritime treasures, sank in 1708 near the historical Caribbean port of Cartagena, and its wreckage was located in 2015. "The discovery of this ship — one of the most important that navigated in our seas during colonial times — begins a new chapter in the cultural and scientific history, not only of Colombia but of the entire world," Santos said on national television from Cartagena. "Questions about navigation, world trade, about colonial costs, will be answered." The government will accept further offers to recover the ship and its treasure, Santos said. A museum will be built to showcase artifacts found in the wreckage. Santos did not disclose the investor behind the first proposal or its terms. 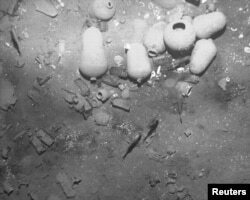 FILE - Artifacts found in the wreckage of Spanish galleon San Jose are seen in this undated handout photo provided by the Colombian Ministry of Culture, Dec. 5, 2015. Archaeological excavation and scientific tests on the wreck will continue to ensure it can be properly preserved, Santos said. The San Jose was part of the fleet of King Philip V, who fought the English during the War of Spanish Succession. Six hundred people died in the shipwreck when an English fleet engaged the galleon in a gunfight. A team of international experts, the Colombian navy and the country's archaeology institute discovered the wreck in 2015. The San Jose was the subject of a legal dispute between Colombia and Sea Search Armada, a U.S. salvage company, which said in 1981 it had located the area where the ship sank. The company and the government agreed to split any proceeds from the wreckage, but the government later said all treasure would belong to Colombia, a view that was backed by a U.S. court in 2011.